Chelsea M. Campbell brings plenty of humor into Starlight - for instance, I couldn't help but laugh when Adrienne's genie, Saiph, insisted on staying at her house which leads to her hiding him in the attic away from her mom. When he sees that her bedroom is decorated in unicorns (she hasn't redecorated since she was six years old), he teases her about needing help with style. I personally would love for my bedroom to be decorated in unicorns, but I don't think my husband would like that too much! Those scenes had me giggling. I liked the light and non-preachy way the subject of bullying was dealt with which in my opinion made a greater impact than if it had been presented in a hard hitting way. Bullying is so rampant nowadays, and Starlight shows both sides. You see the ugly way the popular girls behave towards Adrienne, and the way she shrinks into herself when those girls go out of their way to insult her. The shenanigans (there's really no better word!) that go on with Saiph around made me laugh, especially when Adrienne had to scramble to cover his presence around her mom, in front of her coworkers, and at school. There are also cute moments, too, where she realized he treated her with dignity and respect, something no one has done before. While reading about Adrienne and thinking of all the different ways she could respond to those stuck up girls, I was taken back to my own high school days where I wish I had defended myself instead of letting a small group of other girls push me around. When she starts to fall for him, I was dying to know what was going to happen. Would he fulfill her wishes and then leave? Would he find a way to stay with her? The possibilities were endless! 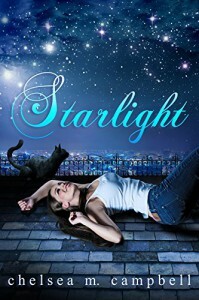 Starlight was exactly the kind of book I needed after reading so many dark and heavy stories lately, and I recommend this to anyone looking to lose her/himself in an uplifting and fun story.